The Kaeser SAM Controller is the next generation in compressed air management. The adaptive Sigma Air Manager system uses advanced algorithms to monitor and control all components within your compressed air supply system, with an aim to achieve maximum cost savings. 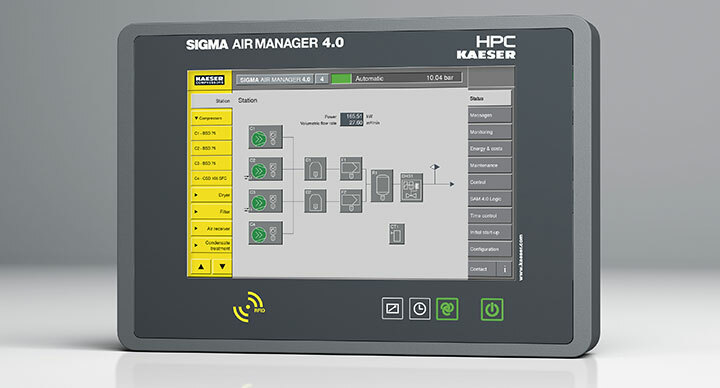 Part of the KAESER HPC family of compressed air management, the Sigma Air Manager system is designed with Industry 4.0 in mind. The KAESER SAM controller is responsible for the entire compressed air supply system and manages data streaming to a centralised application called HPC SIGMA SMART AIR. Process data from the compressed air system is transmitted in real-time. Continuous analysis is subsequently performed with help from specialised algorithms in order to make use of the gathered data, such as for predictive maintenance purposes. As a result of this advanced technology and energy saving potential, investing in the Sigma Air Manager 4.0 makes for simple economics. Qualifying for the Energy Technology List (ETL), the HPC KAESER Sigma Air Controller 4.0 is a registered product that is eligible for 100% tax relief under the Enhanced Capital Allowance (ECA) scheme for energy saving technologies designed to help reduce carbon emissions. For more information, take a look at this Sigma Air Manager PDF Manual. Market leading Adaptive 3-D advanced compressor control and management for maximum energy efficiency – key technology for Industry 4.0. Local and remote visualisation, plus an intuitive, durable and easy to use touchscreen. Air usage data, flow and cost reporting plus on demand energy reports. Signalling from ancillary equipment – run/fault. Predictive maintenance and remote diagnostics providing maximum system availability and reduced servicing costs. Integrated programmable control for individual programmable functions. In-built security and future dynamic. With this KAESER SAM controller the combination of remote diagnostics and needs-based, preventative maintenance helps assure maximum compressed air supply dependability. Through the availability of compressed air system process data and the resulting analysis, it is possible to identify the perfect point in the future when your compressed air supply system should be maintained and serviced. This prevents costly periods of downtime and increases energy efficiency. Centralised compressed air system monitoring (for Predictive Maintenance) is carried out in the HPC DATA CENTER, together with permanent energy management, to ensure maximum effectiveness of the compressed air supply system throughout its lifecycle. This combination of remote diagnostics and demand-orientated preventative maintenance ensures maximum availability and can reduce service costs by up to 30%. For more information about our Sigma Air Manager 4.0 (SAM 4.0) compressed air management systems, or any other products and services like nitrogen generators and vacuum pumps, please contact us via our contact form or call 01695 51010 to speak to one of our technical advisers.